Study this photograph of President Donald Trump with Saudi Crown Prince Mohammed bin Salman and tell me what you see. Here's what I see. 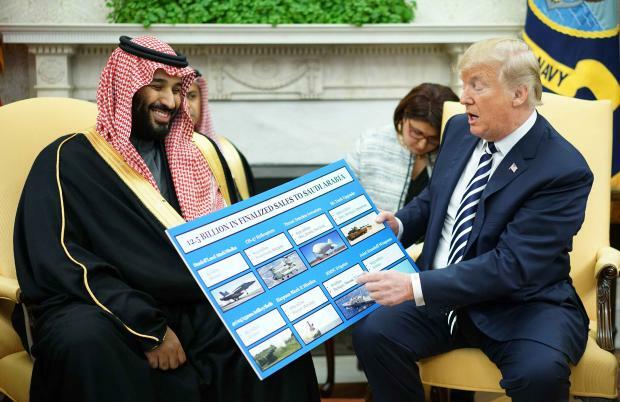 Trump is propping an illustration board on his knee and gesturing at photos of military hardware that the U.S. is proposing to sell to Saudi Arabia or has already contracted to sell. The Prince is looking down at the board and smiling. The scene in the photograph is completely unremarkable to my eyes. It shows Trump engaging in the kind of act that routinely occurs when businessmen in the West are discussing proposals. For example, the last visit for Mohammed bin Salman to the United States, President Trump put a board on his chest. I’m criticising even the president himself, Trump. He’s got a board on Mohammed bin Salman’s chest and by doing that he’s not only putting it on the chest of Mohammed bin Salman, but on the chest of every Arab, Saudi or Muslim. This is humiliating to us all. Unfortunately, he was representing the country. I felt like I was watching a car crash. The leader of the greatest country in the world, and they put a board and describing items as if they’re in a supermarket. Until bin Farhan pointed it out, I didn't notice that the board could've been resting against MbS's chest -- and I don't think the angle of the photograph allows certainty that it was. But bin Farhan saw an outrageous insult to all Arabs and Muslims not to mention the Saudi royal family. And yet he's obviously not a 'primitive.' He lives in Germany; from his clothing and mien we can see he's a cosmopolitan Saudi. And while it's not entirely clear from the brief excerpt I quoted from the MEE interview, I think bin Farhan was also directing anger at MbS for getting into a humiliating position. Bin Farhan's anger at the ruling Saudi royals is part of a long story, which the complete interview reveals is also a very complicated story about an opaque society. But when billions of dollars in weapons and American entanglements with Middle Eastern wars are involved, this is not about cultural gaffes. It's about the government of the United States getting into alliances with governments it understands not at all, such as Saudi Arabia, in order to remake societies it understands not at all, such as Syria. The upshot invariably piles more death and destruction onto whatever havoc existed in the societies in the first place. Every time this happens we say that we must learn from our mistakes. Often we do learn lessons. But then we make new horrific mistakes when we invariably run into yet more situations in other foreign societies we've gotten tangled up with and don't understand. So it's not about whether Americans should be 'engaged' with the rest of the world or become isolationist. Nor is this about Americans learning to make smarter foreign policies. It's about recognizing that it's no use learning from our mistakes if we don't limit our foreign engagements to doing the least harm.